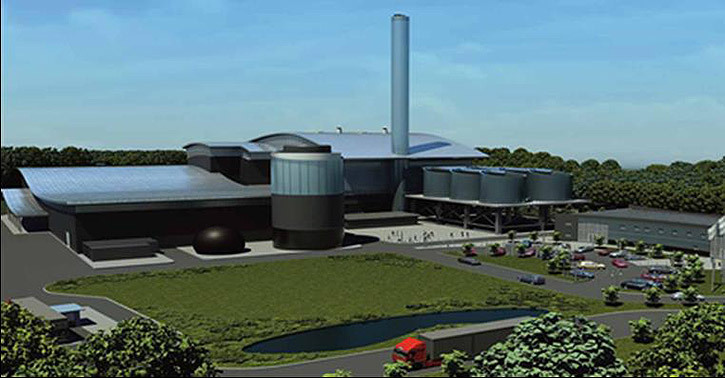 VINCI Environment UK, a 50/50 subsidiary of VINCI Construction UK and VINCI Environnement, has won the AmeyCespa contract to build the energy-from-waste unit in Allerton as part of the future multi-process waste centre of the County of North Yorkshire and City of York. The design-build contract covers the energy from waste unit and related buildings. Taylor Woodrow, the civil engineering division of VINCI Construction UK, will handle overall site development and civil engineering for the buildings. VINCI Environnement will be responsible for designing and commissioning the processes. Construction of the Allerton plant will get under way in February 2015 and the facility is expected to be fully operational in 2018. Residual household waste received at Allerton Park will first be mechanically sorted. Some of the waste will then be anaerobically digested to recover energy in the form of biogas. The remainder, about 320,000 tonnes per year, will be incinerated in two lines, each with a capacity of 20 tonnes per hour, to generate 25 MW of electricity for export to the grid. The plant will thus be able to provide power from renewables for some 40,000 households located near the site. To date, 55% of the 520,000 tonnes of waste produced each year by the 760,000 inhabitants of the County of North Yorkshire and the City of York is sent to landfill. The locally set objective is to reduce the volume of waste going to landfill by 90% and to increase the recycling rate using sustainable waste treatment processes. Making a significant contribution towards achieving this objective, the Allerton Waste Recovery Park will treat 50% of the household waste generated in the area by 2020. VINCI Environment UK optimised the design of the plant to improve energy resources and reduce operating costs in order achieve higher energy-from-waste objectives. The fume treatment processes will be optimised to reduce the reagent consumption and residue production while maintaining a high performance level.